The treatment of rheumatoid arthritis has been revolutionized in recent years by the development of biologics targeting specific components of inflammation. The current biological agents consist of different mechanisms to achieve therapeutic effects. It has been clear that biological agents may be associated with an increased risk of infections. We report a 49-year-old female with 19-year history of rheumatoid arthritis. She received intravenous tocilizumab treatment and developed right hand and forearm cellulitis three months later. Laboratory examination showed a normal WBC count, and the neutrophil and CRP level were only slightly increased. 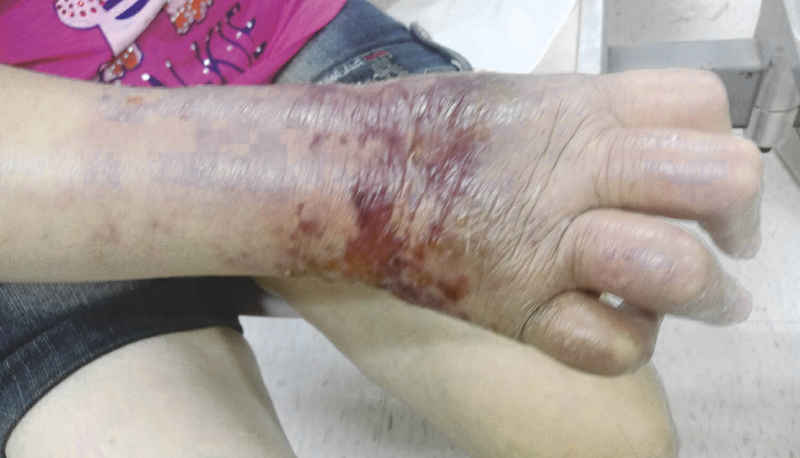 Cellulitis resolved after antibiotics treatment for twelve days. Tocilizumab was resumed two months later and patient had recurrent cellulitis. The Naranjo score was 6 points and this adverse drug event can be classified as probable. This case report is to alert clinicians for infections while using biological agents. 1.1.Manjari Lahiri, William G. Dixon: Risk of infection with biologic antirheumatic therapies in patients with rheuma- toid arthritis. Best Practice & Research Clinical Rheuma- tology 2015; 29: 290-305. 2.Jasvinder A. Singh, Kenneth G. Saag, S. Louis Bridges JR, et al: 2015 American College of Rheumatology Guideline for the Treatment of Rheumatoid Arthritis. Ar- thritis Rheumatol. 2016;68(1):1-26. 3.Josef S Smolen, Robert Landewé, Johannes Bijlsma et al: EULAR recommendations for the management of rheumatoid arthritis with synthetic and biological disease- modifying antirheumatic drugs: 2016 update. Ann Rheum Dis 2017; 0:1-18. 4.Chak Sing LAU, Faith CHIA, Andrew HARRISON et al: APLAR rheumatoid arthritis treatment recommendations. International Journal of Rheumatic Diseases 2015; 18: 685-713. 5.Nishimoto N, Hashimoto J, Miyasaka N, et al: Study of active controlled monotherapy used for rheumatoid arthri- tis, an IL-6 inhibitor (SAMURAI): evidence of clinical and radiographic benefit from an x ray reader-blinded ran- domized controlled trial of tocilizumab. Ann Rheum Dis 2007;66(9):1162-1167. 6.James R. O' Dell: Therapeutic Strategies for Rheumatoid Arthritis. N Engl J Med 2004;350: 2591-602. 7.Bongartz T, Sutton AJ, Sweeting MJ, et al: Anti-TNF antibody therapy in rheumatoid arthritis and the risk of serious infections and malignancies: systematic review and meta-analysis of rare harmful effects in randomized controlled trials. JAMA 2006;295(19):2275-2285. 8.Campbell L, Chen C, Bhagat SS, et al: Risk of adverse events including serious infections in rheumatoid arthritis patients treated with tocilizumab: a systematic literature review and meta-analysis of randomized controlled trials. Rheumatol Oxf 2011; 50(3): 552-562. 9.Van Vollenhoven RF, Emery P, Bingham III CO, et a: Long-term safety of rituximab in rheumatoid arthritis: 9.5- year follow-up of the global clinical trial programme with a focus on adverse events of interest in RA patients. Ann Rheum Dis 2013; 72(9): 1496-1502. 10.Alten R, Kaine J, Keystone E, et al: Long-term safety of subcutaneous abatacept in rheumatoid arthritis: integrate analysis of clinical trial data representing more than four years of treatment. Arthritis Rheumatol 2014; 66(8): 1987-1997. 11.Singh JA, Cameron C, Noorbaloochi S, et al: Risk of seri- ous infection in biological treatment of patients with rheu- matoid arthritis: a systematic review and meta-analysis. Lancet. 2015; 386:258-265. 12.Kourbeti IS, Ziakas PD, Mylonakis E. Biologic therapies in rheumatoid arthritis and the risk of opportunistic infec- tions: a meta-analysis. Clin Infect Dis 2014; 58(12): 1649-1657. 13. 陳怡行、蘇維鈞、謝松洲等：2015年修訂版風濕病醫 學會免疫風濕病患接受腫瘤壞死因子抑制劑類生物製 劑結核感染篩檢與防治共識建議。Formosan Journal of Rheumatology 2015; 29:1-8. 14. Dixon WG, Hyrich KL, Watson KD, et al: Drug-specific risk of tuberculosis in patients with rheumatoid arthritis treated with anti-TNF therapy: result from the British Society for Rheumatology Biologics Register (BSRBR). Ann Rheum Dis. 2010;69(3):522-528. 15. Syed Farhan Bari, Afsha Khan, Tom Lawson: C reactive protein may not be reliable as a marker of severe bacterial infection in patients receiving tocilizumab. BMJ Case Rep 2013; 1-2.